Ugh ... pregnancy! (Nope, not preggo, lol.) Aside from the obvious reasons for disliking pregnancy (sciatica, feet swelling, back pain, etc.) there's a reason less obvious, but affecting me forever. (Drama queen, much?) I'm talking about feet growing. Many women complain about their feet getting larger during pregnancy. 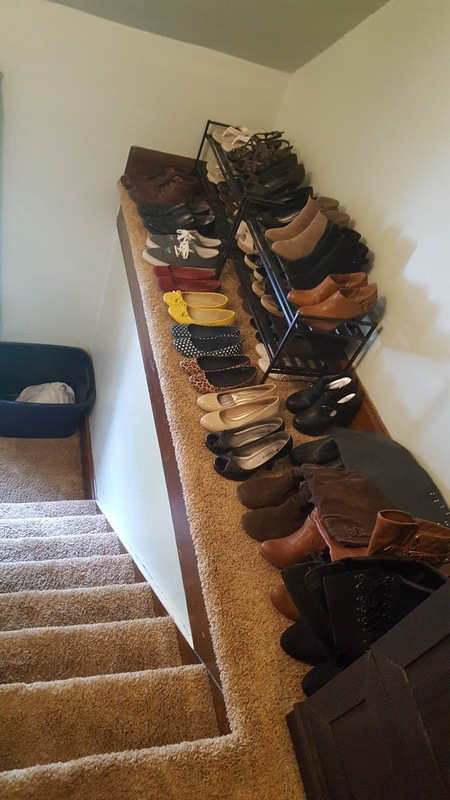 With my giant, beautiful collection of shoes, I REALLY hoped I'd luck out. Nope. Feet are bigger. Shortly after I gave birth (August 2016,) I purged many of my shoes that no longer fit. I couldn't do it all at once for fear of mental breakdown, haha. Well, after 2 years living at our current house, I finally organized all my shoes, which unfortunately meant getting rid of the few remaining shoes that didn't fit. Today I say goodbye to one of my all-time faves; my black pinstripe pumps. I originally got them from Shoe Carnival over a decade ago for $15! On this day in 2017, I wore this $36 outfit . On this day in 2015, I wore this $25 outfit . On this day in 2014, I wore this $35 outfit . On this day in 2013, I wore this $21 outfit .